Let your cream cheese sit out till it reaches room temperature. Then in a medium bowl combine cream cheese and vanilla extract. Beat till smooth. Add marshmallow creme and beat on medium till everything is nice and smooth, scraping down sides of bowl as you go. Serve with your favorite fruit. 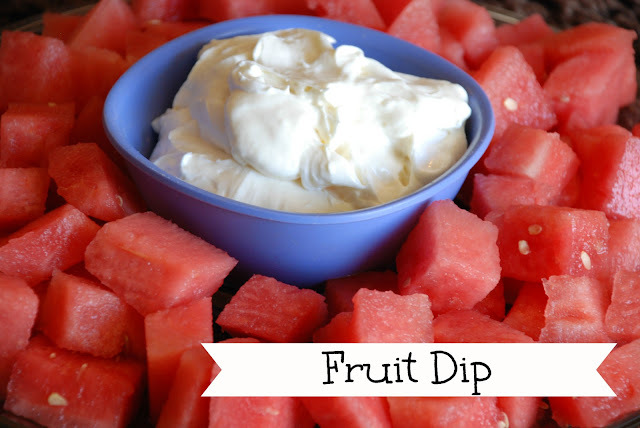 I know there are a million different recipes for fruit dip out there, but this is ours and we love it. During these hot summer months there are a lot of nights when dinner does not sound good, so we cut open a watermelon, make some fruit dip, and tada! !